How to add Cortana reminders to Calendar app in Windows 10? As it is visible here in the below picture, you can see Cortana and its "Reminders". 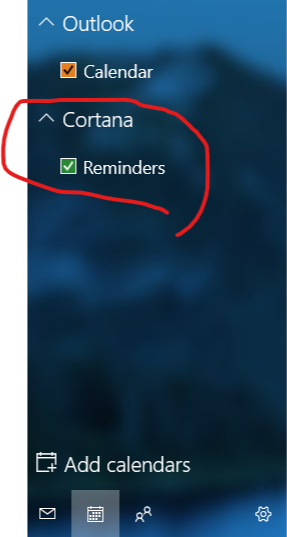 This is my main PC and I can see both Cortana and under its title I can see "Reminders", however, in my Windows tablet I cannot see this option there. How can I manually add it in my Windows tablet? My devices are both connected to my Microsoft account. Is there a free online calendar with a timetable? How to get a single view of all my calendars? Assist me in creating ics-events with complicated repeat patterns?